Update Sept. 30, 2012: For the past two weeks, massive demonstrations have rocked Haiti, protesting constitutional changes, the corruption of the Martelly government and the outrageous cost of living – a general strike in Les Cayes and demonstrations in Cap Haitien Sept. 21 and 27, in Gonaives Sept. 24 and on Sunday, Sept. 30, to commemorate the anniversary of the 1991 coup that overthrew the first Aristide administration, in Port-au-Prince and in cities large and small throughout Haiti. The overthrow of Jean-Claude (Baby Doc) Duvalier in 1986 led to the creation of a new democratic and liberal Constitution in 1987, ratified in a referendum by an overwhelming majority of Haitians. It recognized Haitian Kreyol as an official language, along with French, and legalized Vodun, the religion of the majority of Haitians. It provided for grassroots participation in national decision-making, decentralized the nation’s finances and political structure, and provided for protection of human rights. Its goal was to protect the democratic gains of the movement that rose up against Duvalier, to prevent a powerful executive from ever gaining dictatorial control again, and to overturn some of the most repressive Duvalier era laws. Now, however, the democratic and participatory spirit of the 1987 Constitution has been subverted by the illegitimate President Michel Martelly, who announced new amendments on June 12, 2012, which concentrate executive power and herald the return of death squad Duvalierism to Haiti. Martelly took office on May 14, 2011, in a flagrantly undemocratic (s)election process, in which Haiti’s largest and most popular party, former President Aristide’s Fanmi Lavalas, was not allowed to participate. The Provisional Electoral Council announced after the first round of voting that Martelly had finished third, thus not eligible for the run-off, but the OAS (Organization of American States), in a much criticized move, sent a commission to rule that he really finished second. 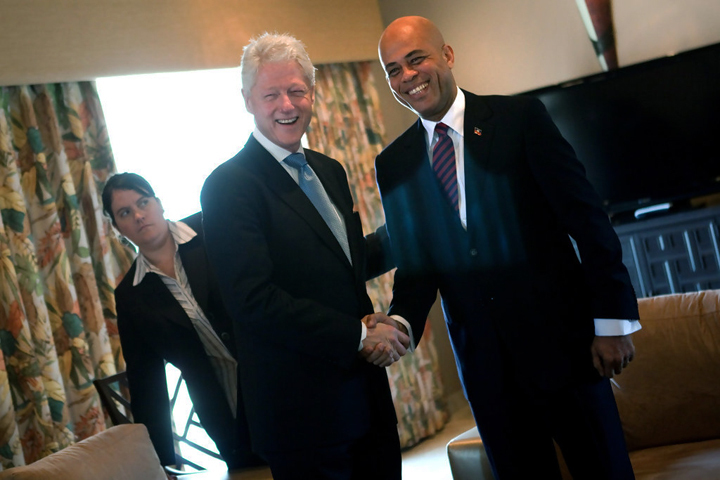 Hillary Clinton reinforced this decision when she flew to Haiti at the height of the Egyptian revolution to demand that Martelly be in the run-off. An anonymous supporter in Miami paid $6 million to the Spanish public relations firm Sola and Associates – who ran the Calderón campaign in Mexico and worked on John McCain’s – to manage the Martelly campaign, an enormous amount of money in Haiti. The democratic and participatory spirit of the 1987 Constitution has been subverted by the illegitimate President Michel Martelly, who announced new amendments on June 12, 2012, which concentrate executive power and herald the return of death squad Duvalierism to Haiti. Martelly won this fraudulent “runoff” with a voter turnout even lower than the first round’s 22.8 percent. The 716,989 votes cast for Martelly constitute only 15 percent of Haiti’s 4.7 million registered voters, according to the Congressional Research Service. Martelly was a member of the Duvalier family’s death squad, the tonton macoutes, when he was 15 and a cadet in the former Haitian military academy as a youth. He supported both coups against President Aristide in 1991 and 2004 and was rumored to have accompanied the FRAPH death squads on their nightly raids after the first coup. A former musician, Martelly constantly demeaned and insulted Aristide in his stage performances. 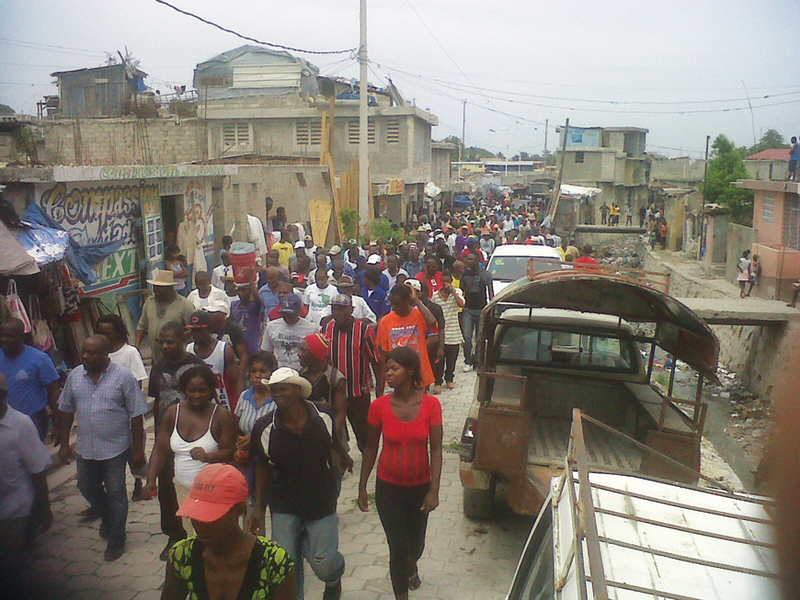 Martelly welcomed the return of Duvalier to Haiti in January 2011. He socializes with him and has been openly photographed in his presence. He has not pursued any of the legal charges against Duvalier, and now his administration is beginning to look more and more like the despised Duvalier dictatorship. Martelly has brought many Duvalierists and members of Duvalierist families into his government in a variety of roles, including departmental Délégates (representatives of the president to the departments). Duvalier’s son is a close advisor. The new amendments published by Martelly ignore the amendment procedures mandated in 1987. They centralize power in the executive and revive several repressive and undemocratic Duvalierist period laws. Procedurally, to change the 1987 Constitution, the president sends proposals to Haiti’s parliament. After approval, they are published in the government’s official newspaper, Le Moniteur, but they don’t take effect until the next president takes office, to assure none of the amendments can benefit the departing president. When previous President Preval left office, he and the parliament rushed through amendments, which were published the day before Preval’s term ended. However, both chambers of Parliament immediately protested that the published changes did not correspond to the language they had actually approved, and the distribution of Le Moniteur was suspended. Martelly took office facing this crisis and after a few weeks published a decree suspending the amendments. He then established a commission to ascertain what had happened and make recommendations. All original written and audio-visual transcripts from the two-day debates in the National Assembly had disappeared – with no investigation and no one held accountable. The commission submitted its report to Martelly at the same time various sectors of Haitian society tried to mobilize against this whole process, warning Martelly of the anti-constitutionality of such a “revised” amendment process. The new amendments published by Martelly ignore the amendment procedures mandated in 1987. They centralize power in the executive and revive several repressive and undemocratic Duvalierist period laws. Secretary of State Clinton, the U.N., and the U.S., French and Canadian ambassadors now demand Martelly publish the amendments, as they revise the process for establishing a permanent Electoral Council, which these governments want before funding future elections or providing any more financial aid. When Martelly published the new amendments, for so called “material errors” made during the original publication a year ago, the president of the Senate once again claimed they are not what was voted on in 2011. The 1987 Constitution allowed for the selection of the Electoral Council at a grassroots level, with nominations coming from equivalents of U.S. county and state level representatives. This grassroots participation has never been put into practice, however, and the selection has come from above, with limited diversity, to create Provisional Electoral Councils. The new Constitution changes this process so that the president (Martelly) the Supreme Court (with many members chosen by Martelly) and the legislature (mostly bought off) select three members each for a Permanent Electoral Council, completely undermining grassroots participation and centralizing control from above. This top down selection helps guarantee “demonstration elections,” which are a public relations instrument to create the illusion of democracy and provide a civilian face to the U.N. occupation that has been in place since 2004. (See http://sfbayview.com/2010/haitis-election-circus-continues-and-wyclef-jean-wont-take-no-for-an-answer/.) They act as a camouflage for the ongoing quest of the U.S., France and Canada to undermine and defeat Haiti’s grassroots movement. The 1987 Constitution requires Parliament to ratify the president’s choice for prime minister. The new amendments allow the president to appoint the prime minister after merely “consulting” the heads of the two chambers of Parliament. The 1987 Constitution provides for the president of the Haitian Supreme Court to assume the presidency and organize new elections in all cases of “presidential vacancy.” The new amendments make the prime minister the provisional president, without any need for parliamentary ratification, and require the provisional president to organize new elections within four months. The 1987 Constitution requires that a retiring president skip four years before running for president again, so there is no immediate succession. The new amendments stipulate that the four months the prime minister serves as interim president count as a full term, thus a president such as Martelly could resign during the fourth year in office, transfer the presidency to the prime minister he or she has appointed, then run again when the term ends without waiting four years, increasing the threat of a tyrant gaining dictatorial power. The 1987 Constitution requires the president to submit a detailed – line item – annual budget and the previous year’s expenditures report for parliamentary ratification, and gives Parliament the power to refuse to legislate on any matter until these financial requirements are adequately filed by the executive. The new amendments provide that a “general budget” and a “general expenditures report” will suffice, thus limiting parliamentary oversight of the budget. Violation of these new laws can result in even the DEATH PENALTY. The 1987 Haitian Constitution had eliminated the death penalty. These provisions punish the mere expression of certain political beliefs, even in private, by the death penalty. It is not necessary for one to act on their beliefs to make it a crime. There is also no specific legal definition of the ideologies condemned by this law. This article can only serve to restrict free expression and the dissemination of ideas in general. To confuse matters further, Congress voted and the Martelly government published these amendments only in French. The 1987 Constitution recognized Haitian Kreyol as an official language, and Parliament approved both French and Kreyol versions of the 1987 Constitution. 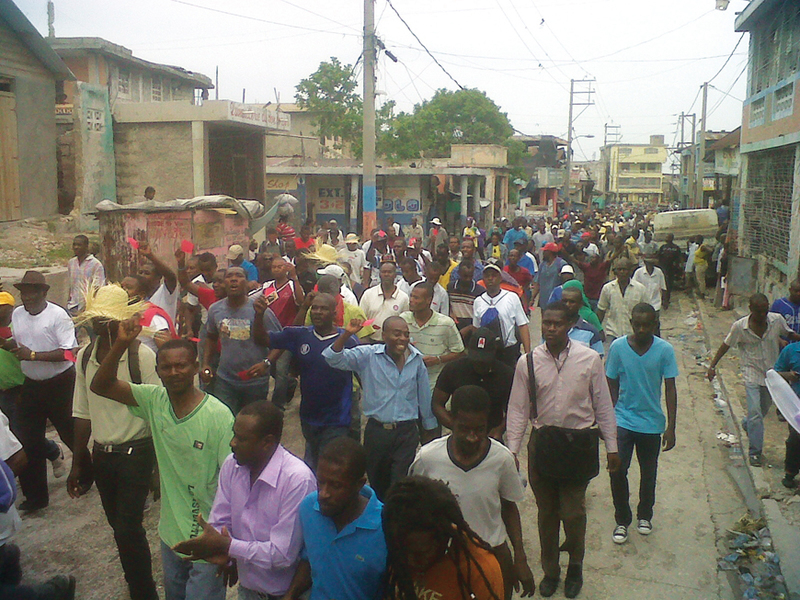 Many Haitians now feel there exist two contradictory constitutions if these amendments were to stand. There is huge opposition in Haiti to these new amendments, and they are much discussed in the media, although little information has reached the U.S. public. Jean-Sébastien Roy, whose father helped write the 1987 Constitution, says that those who oppose the amendments are asking Martelly again make a decree to suspend the June 12 amendments. If this is not done during the next 12-18 months they will call for a new constitutional process to amend the 1987 Constitution and reconcile the two different versions. He says leaders of grassroots organizations throughout Haiti are beginning to network on this issue. The danger of these amendments becomes more clear when understood in the context of Martelly’s campaign promise to restore the hated Haitian army, disbanded by Aristide before he left office in 1995 in one of the most popular actions of his administration. Since Martelly became president, former army personnel have occupied their former bases and are seen wearing new uniforms and armed with new weapons. Under the command of a president who can control the electoral process, name their successor and administer the death penalty to those who protest, the restoration of the army strikes terror in most Haitians and brings back memories of a past they thought they had buried 26 years ago. Charlie Hinton is a member of the Haiti Action Committee, P.O. Box 2040, Berkeley CA 94702, www.haitisolidarity.net/. He may be reached at ch_lifewish@yahoo.com. He would like to thank Jean-Sébastien Roy, a Haitian whose father helped write the 1987 Constitution, for much of the information for this story. He was interviewed on KPFA’s Flashpoints. 90% of this story is false and the 10% left is distorted voluntarily. what kind of author voluntarily lies to the face of the public. It is dishonest and disrespectful to the public. Luicin, tu es un pathetique manteur pour avoir dementi les nouvelles raportees la- haut.